QATSIF will celebrate Mabo Day and Reconciliation Week with Bond University on the Gold Coast. Our QATSIF Round 11 QCE Scholarships open for students in Years 10 and 11. Parents and carers need to speak with schools about applying for their child. QATSIF schools are invited to join Laidley SHS’s annual NAIDOC Celebrations. Graduating QATSIF students are invited to celebrate their achievements with their families and school communities at CQU (Mackay). QATSIF will partner with CQU Rockhampton to celebrate the graduation of our Rockhampton region QATSIF students. 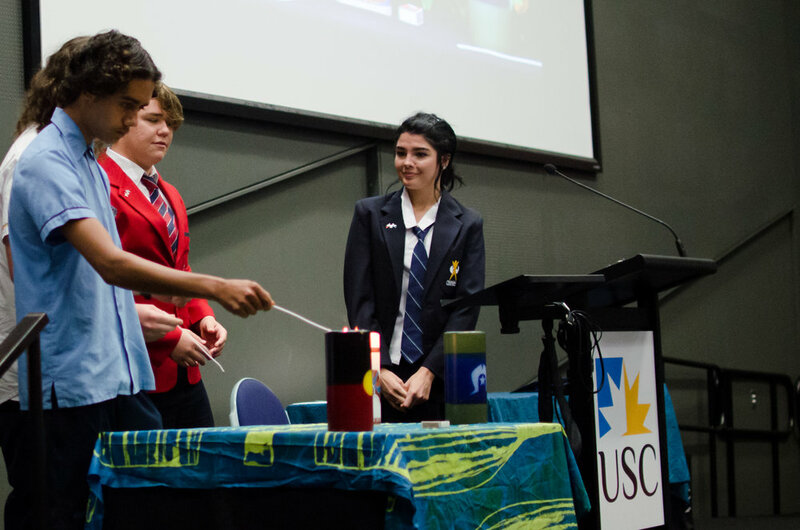 Brisbane South QATSIF schools will gather at the University of Queensland’s St Lucia campus to celebrate the graduation of their Year 12 QATSIF students. QATSIF schools in the Toowoomba region are invited to celebrate their Year 12 students’ graduations at our USQ (Toowoomba) celebration. The University of the Sunshine Coast (Sippy Downs campus) will host QATSIF’s Sunshine Coast Graduation ceremony. Queensland University of Technology (Kelvin Grove) will host QATSIF’s Brisbane north side graduation. Our QATSIF Chair Professor Cindy Shannon with some of our graduating QATSIF students at QUT. Australian Catholic University will host our New Recipients’ celebration for schools on the north side of Brisbane. Applications for the 2017 InspireU Senior Engineering camp are now open. This camp will be held at The University of Queensland St Lucia campus on the 15th January – 20th January 2017 and is for Year 11 and 12 students who are interested in studying engineering at university. (e) Have school attendance rate of 90% or greater. Preference will also be given to students currently studying at least one or more of either Physics or Chemistry. Applications will close on Friday 11th November 2016. Applications will close on November 11th 2016 and applicants will be notified by the 18th November 2016. This year, QATSIF will be holding a stall at Musgrave park for NAIDOC week. Come and say hi to the QATSIF secretariat and ask all your questions in person. We look forward to meeting you there!